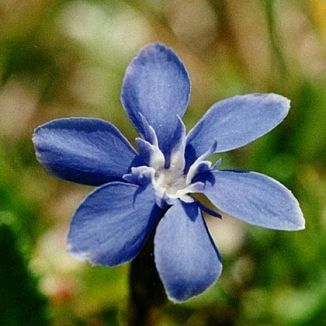 Spring Gentian is not easily confused with other wild plants on this web site. This is the wildflower for which the Burren in County Clare is famed. 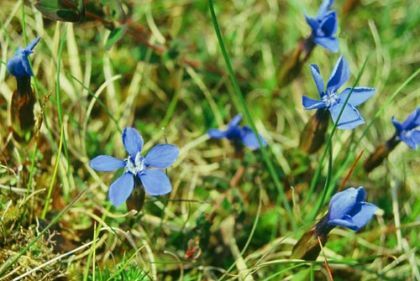 Although there are many startlingly attractive flowers growing in this wonderful limestone area of western Ireland, the Spring Gentian is the plant which has become best known of all by those seeking to see the Burren's great variety of flowers. Its pure, bright blue solitary flowers (20–25 mm across) are extremely beautiful. As each of the five petal tubes unfurl, they spread to reveal a little white throat. Each flower has small fringed lobes or scales between its petals. The flowers are borne on upright stems, the leaves being bright green, oval, mostly in a basal rosette. These exquisite flowers bloom from late April to June. They are best found on grassy areas, near sand dunes and rocky pastures. In Ireland they are confined to the Burren and parts of Counties Galway and Mayo. This native plant belongs to the Gentianaceae family. I first identified this wildflower in 1979 near Bishop's Quarter in the Burren. I photographed it at the Rine, also in the Burren in 2004.